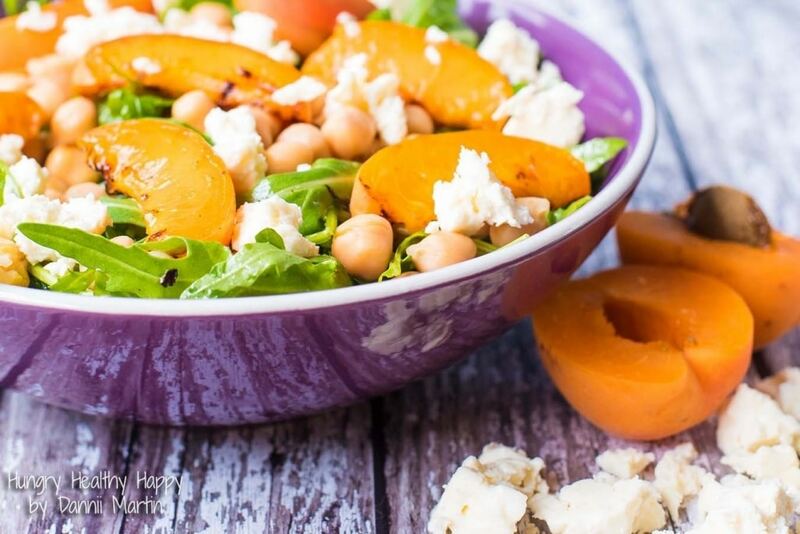 This Apricot, Chickpea and Feta Salad is sweet, fruity and protein packed and has all the creaminess that you know and love from feta. 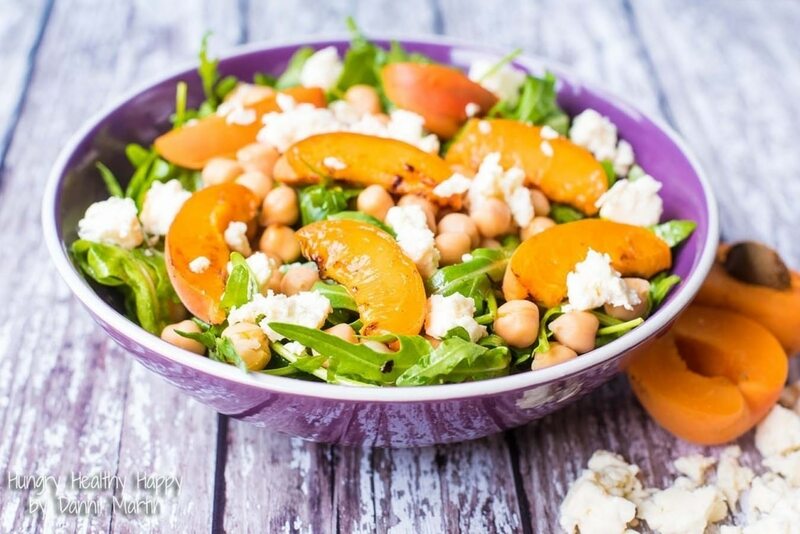 A great way to enjoy apricots before the season is out. It’s Meatless Monday and this is one of our favourite meatless salads. 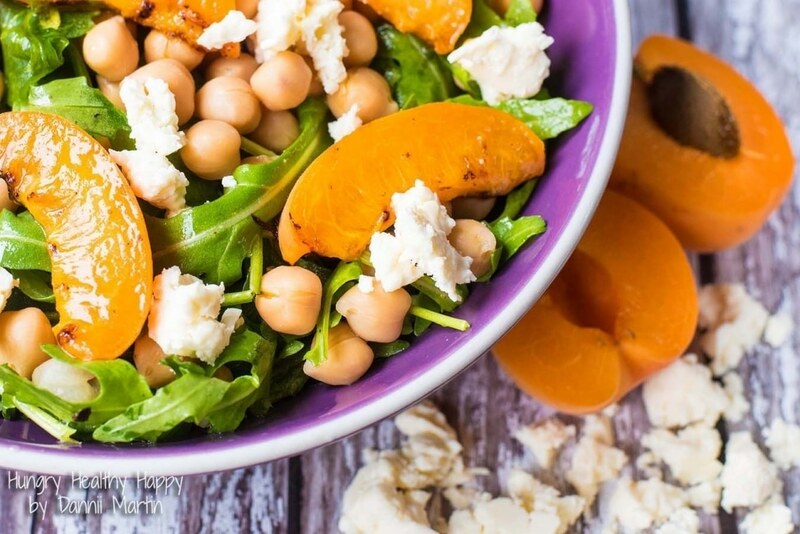 The chickpeas add plenty of protein and the fruit adds texture so you don’t miss having meat. Plus, feta. No reason, just because. 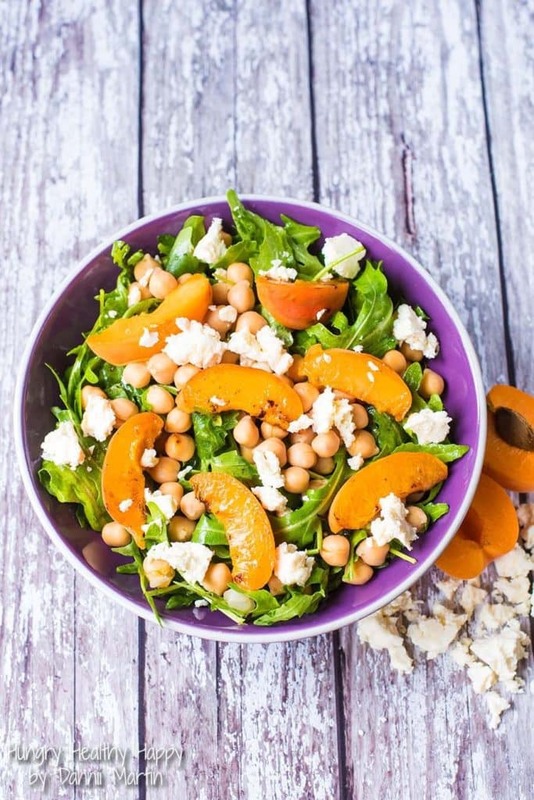 Actually, there is a reason – feta and chickpeas is a delicious combination and it turns out so is apricot and feta. 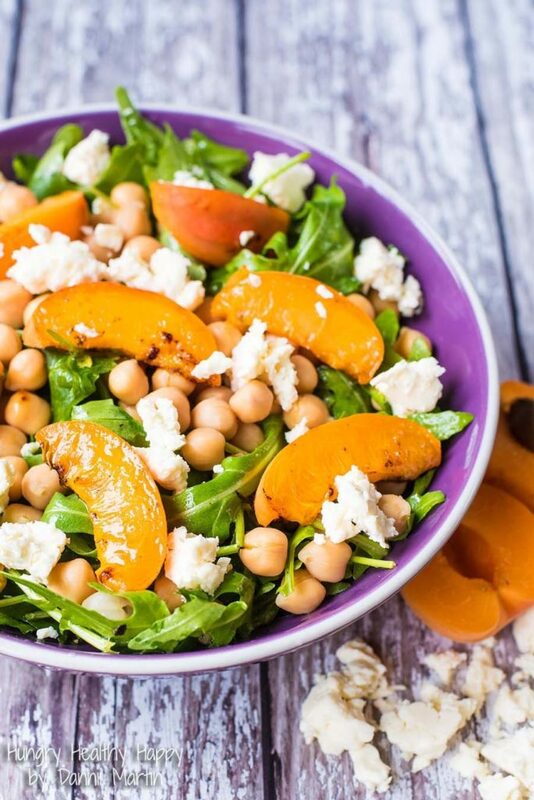 Do you want to be kept up to date on more delicious recipes like this Apricot, Chickpea and Feta Salad? Please subscribe to the blog mailing list (it takes 30 seconds). You will get sent the new recipes straight to your inbox. Your email address won’t be passed on to anyone and you will never be spammed. Avery (our 9 month old daughter for those of you that are new to the blog) has been eating solids for about 3 months now and we try to feed her things that we are eating to make it a bit easier, and so that we can eat as a family as often as we can too. It turns out that there is nothing that this kid won’t eat! 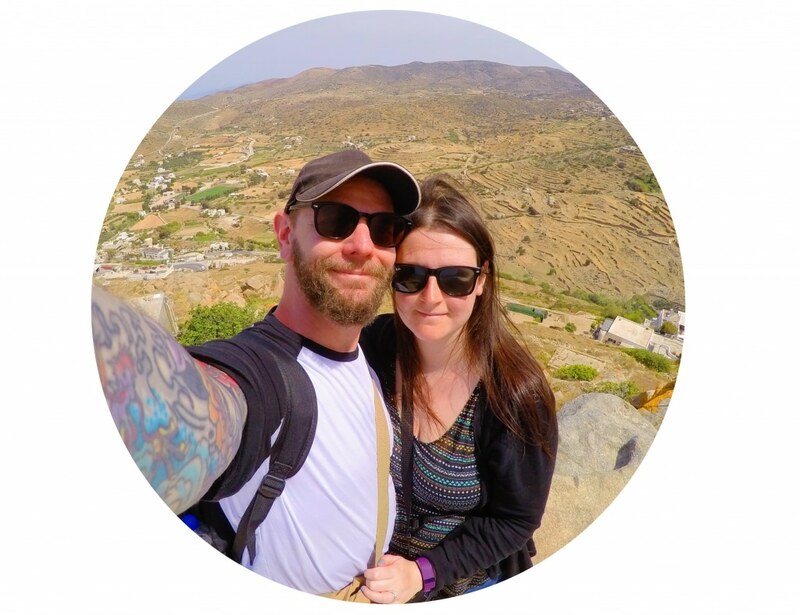 The hilarious thing is, whilst she had cod, sweet potato and broad beans for lunch and Greek lamb, chickpeas and tenderstem broccoli for dinner, I was so exhausted at the end of the day that I just had a sandwich. She eats better than us! Chickpeas are one of her favourite foods at the moment (she has just discovered the wonders of hummus) and she loves practising her pincer grip by picking them up individually. A lot does end up on the floor thogh. Whilst we are really lucky that she loves all vegetables, she loves her fruit too and she was a big fan of this cooked apricot, even if it was a bit slippery to hold. Avery is going to have to wait a while to discover the wonder that is feta, because it’s pretty high in salt. But that just means that there is more for me to enjoy. Mwuhahahaha!! We have been eating a lot of comforting stew type dishes as we are coming towards the end of making the next book – The Healthy Slow Cooker. 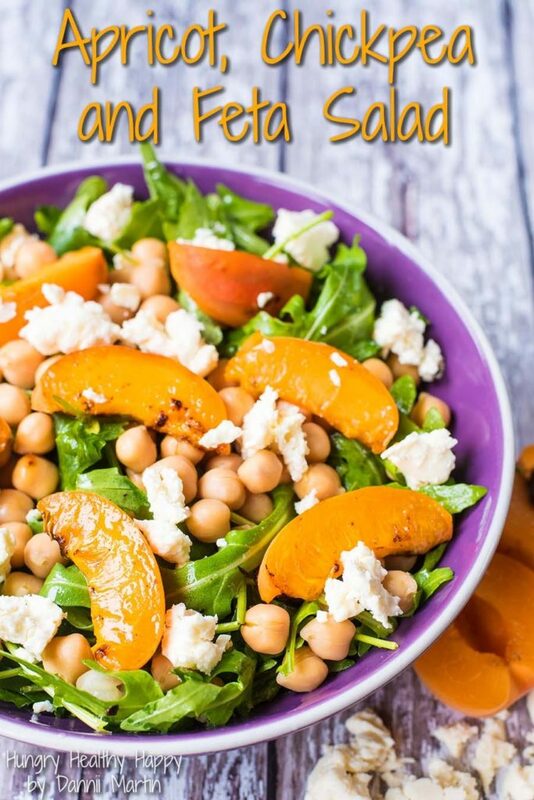 As delicious as all the recipes in the book are, there is only so many slow cooker meals you can eat and we are doing a lot of testing, so at the end of the day we are craving an easy salad like this. 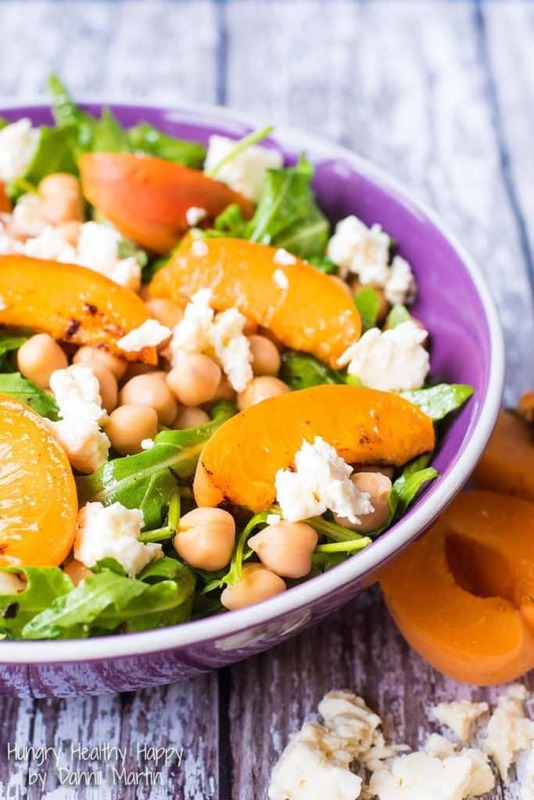 You could use peaches instead of apricots, but we are really loving apricots at the moment and want to make the most of them before the season is out. Dry frying them really brings out the flavour and sweetness and it pairs perfectly with the creamy feta. You could use a different bean and a different cheese too – feel free to customise it and use whatever you need to use up. Heat a non stick frying pan (without oil) and add the sliced apricots and cook for 30 seconds each side. Put the olive oil, vinegar, mustard and salt and pepper in a large bowl and mix well. Add the lettuce and stir and divide between 2 smaller bowls. Add the chickpeas, cooked apricots and sprinkle over the feta. 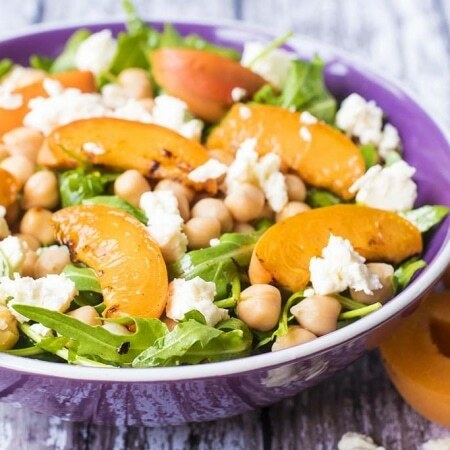 If you like fruit in a salad, why not try our Grilled Peach Salad? Trying salad recipes is not really my think I do not see much salad. This is such a great combination! I love every single one of those separately and honestly would’ve probably never thought of combining like this. Thank you for this idea and recipe!